“Having a compelling vision that excites people is really the key”. These words from Robert Hammond, co-founder of New York’s High Line – the hugely popular urban design project – could sum-up not only their personal approach, but also the attitude at last weekend’s symposium in London, which generated an explosion of ideas for a British answer to the scheme. The High Line Symposium, put on by the Landscape Institute and London Mayor at the Garden Museum, began with a day dedicated to co-founders Josh and Rob, as they told the High Line’s story for the first time in the UK. 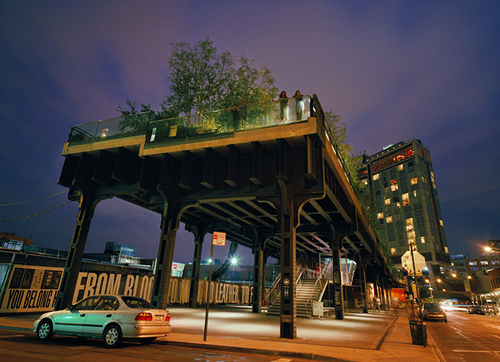 Guests were treated to a day of insignts into how they transformed a rusting and abandoned elevated railway into one of New York’s most popular tourist attractions, a design icon, and a pioneering piece of green infrastructure. Starting out with nothing more than a shared love of the majestic old railway, they were cast as “neighbourhood nobodies” with no money, no plan, and no experience. But their inexperience actually put them in good stead to achieve what they did. Unaware of just how difficult a task it would be, they came at the task with fresh eyes and a spirit of can-do. With a session dedicated to funding, we were privy to some interesting tips on how Josh and Rob raised millions of dollars from private donors. Courting political and celebrity supporters early was key. The pair were expert at putting on one of a kind events to fundraise, with an expert attention to detail and talent for throwing a great party. They fostered close relationships with potential funders, particularly the “highest capacity donors”. However, Josh and Rob emphasise that it was important that the High Line evolved as a community based project too, with small donations from thousands of supporters. Not only did this build up a base of supporters who all felt a sense of ownership over the High Line, but it was crucial to draw in the bigger donors, who liked to see a broad base of support before they gave. Josh and Rob needed the community behind the High Line to clinch those big money donors. Any extra tips? The pair emphasised the importance of saying thank you to donors and to bite off small chunks at a time. Fundraising is hard work but ultimately people want to give. People want to effect positive change. What is so exciting about hearing Josh and Rob’s story is the stimulus they’ll provide to other innovative plans elsewhere. Mirroring the ideas competition that they launched in NYC to generate interest in the High Line, London has just launched its own ideas competition to kickstart thinking about green infrastructure in the capital. It has sparked some weird, wonderful, and occasionally fantastical ideas, from an underground mushroom park to a swimming lane down Regent’s Canal. What is crucial is that the conversation has now begun, and green infrastructure is getting the attention it deserves. Could any of these plans be realised? Stay tuned to see what happens next!